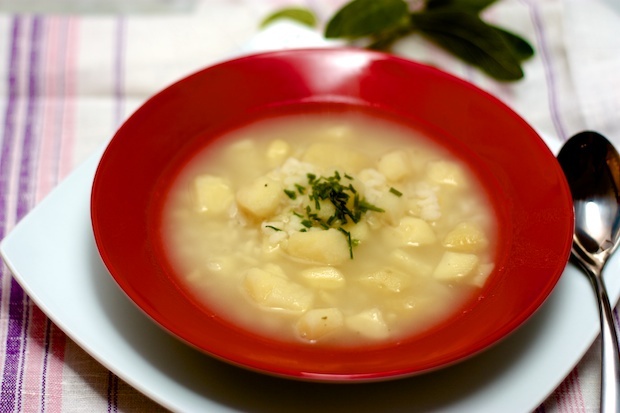 This soup is a classic dish of peasant cooking from Friuli. We have different opinions about its goodness in my family. I personally find it delicious, from the very first spoonful it makes me feel warm and I feel safe at home. Every time that I announce that I’m making this soup my husband snorts, but then after he’s eaten it he promptly says “this was good,” my son hates it, and Colleen who loves soups and stews always finds it delicious. If you have not already tasted this soup, you should give it a try. It can be a complete meal for a dinner when the evenings are cool and can be the base for numerous variations with various ingredients such as onions, beets, spinach and other vegetables according to personal taste. In a pan with high sides arrange the potatoes, sage, and clove of garlic. Add 1 liter of water and a little salt. Boil for about 20 minutes. Remove the sage, garlic, and add the rice and the granulated vegetable broth. Boil over high heat for 20 minutes. Turn off the heat, add the olive oil and parmesan cheese. Mix and pour into individual bowls and serve piping hot with a little ‘of freshly ground pepper and chopped chives. Posted in Recipes, Rice. RSS 2.0 feed.